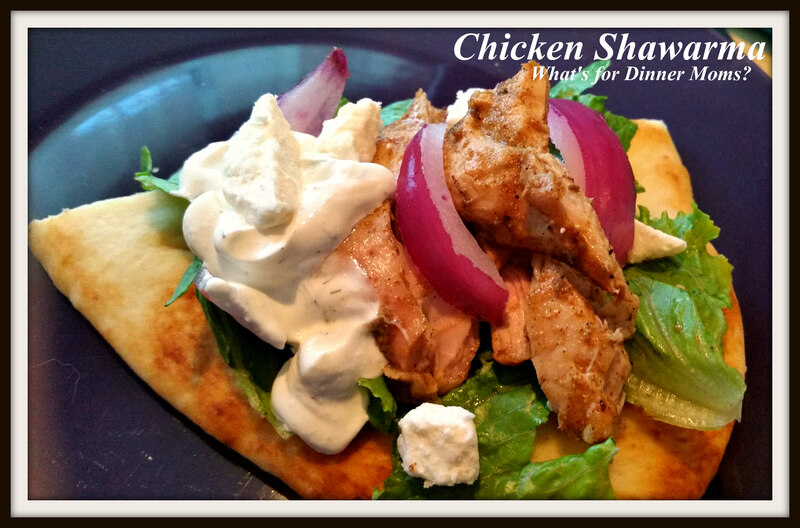 Chicken Shawarma – What's for Dinner Moms? 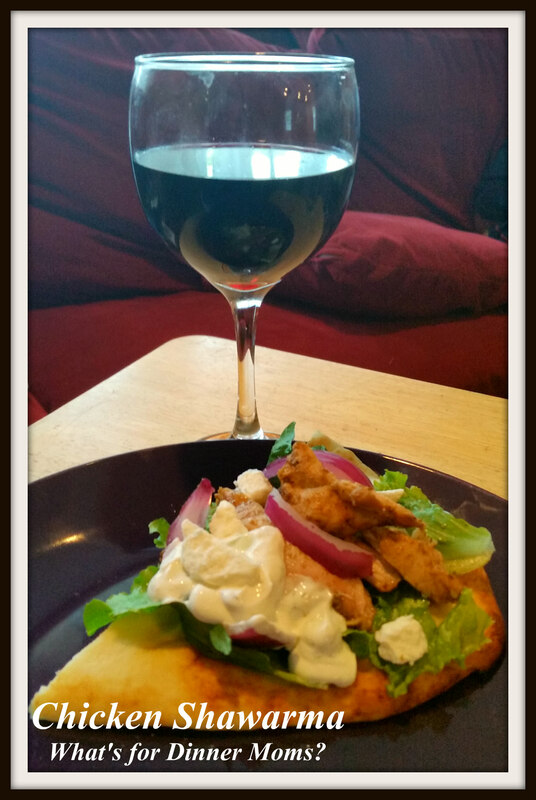 My family loves Mediterranean flavors and since it is summer it is a perfect time for grilling! We de-boned the chicken thighs and removed the skin before marinating the chicken. You can buy the chicken this way but for the price of $.77 a pound versus $2.29 a pound I decided we could do it at home. Do a whole batch at once and you will have it done for the next meals you want to make too! This dish had the perfect Shawarma flavor we were looking for. It was not grilled quite enough for our liking but as the weather was changing and it was late we finished the chicken in the oven. You want those nice dark grill char marks on the chicken as it cooks. This adds more flavor to the dish. Don’t get me wrong the dish was really good but we know next time it will be even better! We served this with lettuce, tomato, feta, tzatziki, and red onion on Naan bread. You may also use pitas instead of Naan if you wish. At least 2 hours prior to no more than 24 hours prior to cooking mix chicken with marinade in a covered bowl or zip top bag. Stir or shake a few times during marinating. To make tzatziki grate cucumber with a box grater or food processor. Place cucumber in paper towels and squeeze all excess moisture from cucumber. Mix sour cream or Greek yogurt with shredded cucumber, dill weed, garlic and salt to taste. This is where you will have to trust your instincts. Taste as you go. It will take quite a bit of dill and garlic to get it to the right taste. Remove chicken from marinade and grill chicken over warmed grill. Baste grill with olive oil before cooking so that the chicken will not stick to the grill. Serve hot with pitas (or Naan), lettuce, tomatoes, red onion, feta and tzatziki as desired. Thank you! Always trying to find something different I can do with chicken and ground beef! I love this dish, and have never considered making it at home. He-Man has been grilling a lot this summer. I wonder if he’d try it. We’d just need to find the chili sauce we love to go with it. The image looks great, and delish! Thank you! It has that tangy Mediterranean spice we love! What a great dinner Marci! you dont make hummus with shawarma? Lol! I don’t care for hummus much so I tend not to think to make it. My family loves it thought. I need to make it more often for them. I love the spices in shawarma! This chicken looks delicious! May I post this recipe on diabetesdietblog.com? Mmm, I’m going to try this (without the bread) when summer rolls around. I hope you like it! This would be delicious in a salad too. Add cucumbers, chick peas, lettuces, tomatoes and onions. Yummy!